The Minions Are Taking Over The World! LOOK: Proof That Minions Are Taking Over The World! It's the end of our world as we know it, and the beginning of theirs. That isn't a product of Photoshop mastery—though it isn't also what you think it is. Recently, a conspicuously strong gust of wind broke loose a giant inflatable minion from its moorings in North Dublin, Ireland. And where did the 40-foot tall helium titan end up? Unfortunately—and hilariously—at the Old Swords Road (what a seriously cool name for an expressway), where it probably elicited a lot of WTFs from commuters the moment they saw it crashing onto daily traffic. 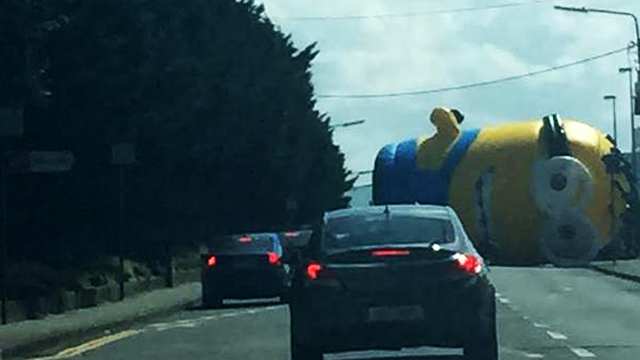 Reports indicate that the Colossal Minion was primarily intended to promote a local fair. The Survey Corps Authorities were then able to contain the gas-ly giant, but damage had already been done: a driver got the side mirror of his car knocked off. Making matters more laughable was the reaction of one Dublin city councilor. Though fairly an isolated case, don't you think it's quite troubling that an enormous minion pops out of nowhere and grabs headlines? Come to think of it, those yellow Tic Tacs, in plain sight, have this cutesy nature...although this one is ODDLY BIG. Are we seeing the start of an invasion? Probably not. But quite a laugh, right?